Reports of Cesium Cs-137 and Cs-134 Pacific Salmon contamination detections, have been added to the EnviroReporters Radiation Food Lab list in the last month. The Salmon were caught off Alaska, and the Philippines. 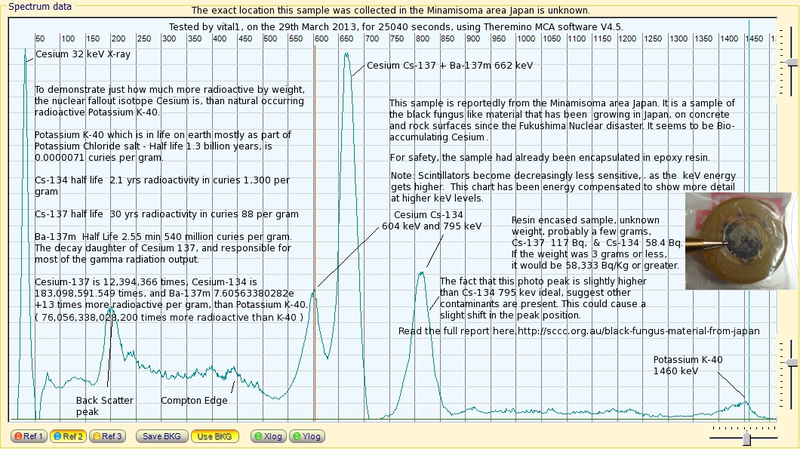 These detections indicate the Bio-accumulation of Cesium from the Fukushima Nuclear Disaster. A lot of food and environmental detection reports tend to concentrate on Cesium detection. This is because it is relatively easy to test for, and detect. If Cesium is present in a test result, there is a possibility that other types of radioactive isotopes are also present, but not reported. Fallout is a dirty mixture of isotopes. It is not just Cesium. Some of the other isotope contaminants, particularly the dangerous Alpha emitters, need more specialized and expensive equipment to detect their presence. Here is an excellent 10 minute video on Cesium food contamination and testing, to quickly get you up to speed on the subject. 07.01.2014 – No Elevated Levels of Radiation Found in North Pacific Salmon Samples. Loki Fish Company announced today that laboratory analysis of five salmon species harvested by its fishermen in Puget Sound and Southeast Alaska during 2013 show no indications of elevated radiation levels. Two of the samples registered at trace levels – Alaskan Keta at 1.4Bq/kg for Cesium 137, and Alaskan Pink at 1.2Bq/kg for Cesium 134. There were no detectable levels of iodine-131 in any samples. This first report here is based on a small number of tested fish, and any detected Cesium is of concern. The fish come from the Philippines. As they travel long distances, they could have floated by the vicinity of the damaged nuclear power plant at Fukushima. For months, radioactively contaminated water has been leaking into the sea. Markus Zehringer, head of radioactivity in air and space at the Cantonal Laboratory in Basel, also assumes that the radiation is related to the nuclear disaster in Fukushima. If ingested, Cesium and other artificial radioactive isotopes create radioactive hot spots in the body. Where these radioactive hot spots develop depends on the isotope’s chemical affinities. These damaging radioactive isotopes are often chemically toxic, as well as radioactive. This test chart shows how much more radioactive Cesium is by weight, than naturally occurring Potassium K40. You are welcome to use this chart wherever you wish, to help educate people to the dangers of ingested artificial isotopes. The latest International Food detections reports can be found here. January 2014 Southern Hemisphere Background Radiation Level Report. January 2014 month average background radiation level was 41 % above the pre-Fukushima 4 year average. This is better than the recorded January 2013, 52% above average, and January 2012, 43% above average. This suggests at this location, the Southern hemisphere increasing background levels have stabilized. It means it hasn’t gotten worse, but it is still higher than pre-Fukushima levels for this time of the year. The average 4 year per Fukushima Nuclear disaster local background radiation level recorded from 2007 to 2011, was 0.10 uSv/hr. The spike in this chart around August and September 2008 is mystery. It may have been caused by the operator experimenting. a. There is definitely a seasonal variation in local background levels. A seasonal variation very clearly shows in all the monthly average charts. b. The considerable variation in month averages indicates there is more Northern Hemisphere to Southern Hemisphere air flow break through in the warmer summer months, than in the colder winter months. c. January 2012 day average chart shows whatever was in the air was not mixed as well as in 2013 and 2014. This can be seen by the dramatic swings in the day averages for 2012, when you compared with the day average charts of 2013 and 2014.
d. Something major must have occurred at Fukushima in late 2012 and early 2013, to have caused such a dramatic month average increase for January 2013. Note that for January 2013 most of the month was dry, drought conditions here. The drought was broken by a significant rain event around the 26th January. Explanation of the alert level colour coding in the charts. or look at them individually here.